Links to North Carolina's pick-your-own farms for everything from apples, berries, fruit, pumpkins, vegetables to cut-you-own xmas trees! Generations of families have experienced our family farm adventure. 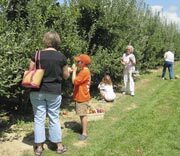 We invite you and your family to visit our 70 acre working farm and U-Pick Apple Orchard in Hendersonville NC nestled in the Blue Ridge Mountains of western North Carolina near Asheville. Stop by the Hillcrest Orchard and pick your own apples and pumpkins - it's good clean fun (except for the dirt) in a beautiful country setting. Picking apples is an activity that can be enjoyed by all ages. We invite families, groups, or friends to come and spend some time together and to take home fresh-picked fruit and memories of a fun filled day. U-Pick begins in late August and continues until early November. Coston Farm: Pick Your Own Apples Right Off the Tree by the Bag, Box or Truckload. Creasman Farms: We are a third-generation family-owned farm located in the beautiful mountains of western North Carolina. We have approximately 35 acres in apples and invite you to come visit our "pick your own" orchard in Hendersonville. Sky Top Orchard: Pick your own apples, peaches, Asian pears and, in season, pumpkins & grapes. Vollmer Farm: offers pick-your-own organic strawberries, blueberries, and blackberries. Check out our home page for up-to-date information on picking availability. Zimmerman's Berry Farm: is a family owned and operated pick-your-own berry farm located in the beautiful western North Carolina mountains of Madison County. Black Raspberries, Blackberries and Blueberries - Red Raspberries. Pick your own fresh apples, blackberries, pumpkins or peaches right in our orchard. Our family has been growing NC apples for four generations. We grow and sell the freshest, tastiest fruit and vegetables that possibly can be grown. We have peaches that ripen from mid June through September. Strawberries are you pick or we pick from late April through the first of June. Blackberries from early June through July. Sweet corn & Watermelons from July till early September and Pumpkins in late September and October. All of these dates can vary with the season, so call before you come for a specific time. Our organically grown Heritage Variety Red Raspberries and Blueberries are coming in by the buckets and gallons, so all of you who would like to come out and pick are now formally invited!